PHOENIX (AP) — Protesters blocked a main highway leading into the Phoenix suburb Saturday where Republican presidential front-runner Donald Trump was staging a campaign rally alongside Arizona's contentious sheriff, Joe Arpaio. For hours, the protesters — about two dozen in total — parked their cars in the middle of the road, unfurling banners reading "Dump Trump" and "Must Stop Trump," and chanting "Trump is hate." Traffic was backed up for miles, with drivers honking in fury. "Learn to speak English," one Trump supporter shouted at the protesters. "You can't even show your face," another pro-Trump attendee said to a protester with a bandanna over her face. Trump and Arpaio have formed a political alliance in recent months, and the billionaire hopes Arizona can serve as a model on how he could win in November. The tough-talking lawman won six straight elections as sheriff of Maricopa County, which includes Phoenix and nearly two-thirds of Arizona's population. He forced jail inmates to wear pink underwear and live outside in tents during triple-digit heat. Arpaio launched dragnets to round up people in the country who were in the country illegally, and a judge ruled that his operations illegally targeted Latinos. Arpaio then launched an investigation that critics contend ended up targeting the judge. In Fountain Hills, thousands gathered for the outdoor rally in the suburb where Arpaio lives. Officers with the sheriff's department were posted throughout the park, on rooftops and on patrol. Officers wearing bulletproof vests stood alongside a Humvee with a gun turret on top. Trump told the crowd that he is "winning by massive landslides" and vowed to rebuild the military and build a border wall with Mexico. He drew cheers from the crowd when he vowed to protect the Second Amendment — which for pro-gun Arizona is a particularly important issue. He never acknowledged the earlier blockade or the protesters in the crowd. Trump supporters waved signs saying "Hillary for Prison" — referring to Democratic front-runner Hillary Clinton — and "Joe for VP," a reference to Arpaio. As Trump looks toward the general election, Arpaio and Arizona — the next major state to vote in the presidential nominating contest — show how conservative populists can thrive even in states with growing minority populations. Arizona votes Tuesday in a winner-take-all Republican primary as well as a Democratic race. Earlier Saturday, about 50 protesters gathered outside the Phoenix Convention Center where Fox News host Sean Hannity was set to interview Trump. They held signs, played music and made speeches, calling Trump "despicable" and "a fascist." One of them, Salvador Reza, said: "He's working to create division." 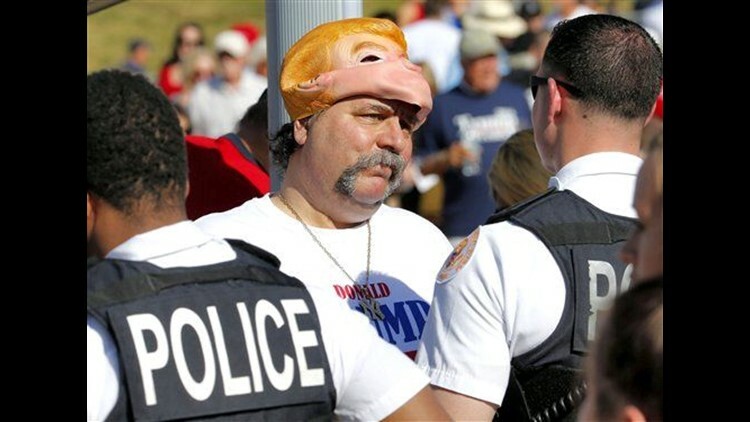 Trump supporters trickled through protesters and security to attend — many wearing red, white and blue. Jason Kitson, 41, from Phoenix, said Trump's hardline stance on immigration is what's needed in Arizona to prevent cross-border drug and human smuggling. Kitson said the wall Trump vows to building all along the Mexican border may or may not be realistic, but it "is getting people's attention." Several thousand miles away in New York, demonstrators also took to the streets to protest the Republican presidential hopeful. The protesters gathered Saturday in Manhattan's Columbus Circle, across from Central Park, with a heavy police presence. Demonstrators chanted: "Donald Trump, go away, racist, sexist, anti-gay." They marched across south Central Park to Trump Tower, the Fifth Avenue skyscraper where Trump lives. Then they marched back to Columbus Circle for a rally. Associated Press writers Ryan VanVelzer in Phoenix, Vivian Salama in Washington and Christina Paciolla in New York contributed to this report.